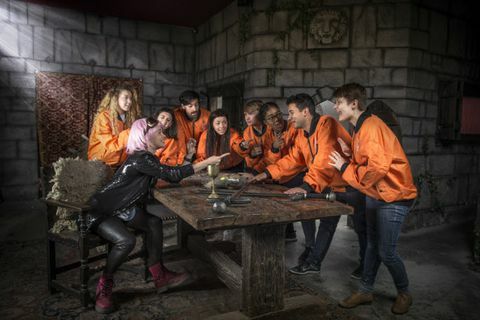 Situated just minutes away from Angel tube station in Islington, The Crystal Maze Live Experience is the ultimate team challenge. Based on the outrageously popular 90’s TV show, you can now experience it for yourself as you take on this immersive adventure of tricksy challenges! You will be guided by your very own eccentric Maze Master, who will take you around four fully themed adventure zones, before your final challenge of The Crystal Dome! Dress code: The Crystal Maze LIVE Experience involves a bit of running, maybe even some crawling, so leave the expensive stuff at home! Instead wear clothes that are comfy and easy to move around in, like trainers and sportswear/casual clothes. No high heels or open-toed sandals. There are lockers where you can stash bags, coats etc. Please note: Pregnancy strictly prohibits entrance into the maze. The Crystal Maze Live Experience - London is not available to book, please sign up to our newsletter for updates and offers on forthcoming and available shows. Don’t drink any booze beforehand. If you do – stern look – you won’t get in. Surprise Surprise: The Maze is not a fashion show so keep your couture in your closet and wear comfy kit and shoes. Like trainers, for instance – trainers are good. The Crystal Maze involves running and crawling and stuff, so Mumsie says you really do need to have a basic level of fitness and health. To keep us out of trouble, you have to sign a waiver before you start. It’s got all the usual stuff. Plus, Mumsie insists. If you’re pregnant – congratulations! The Crystal Maze LIVE Experience don’t allow anyone at any stage of pregnancy to enter the Maze. Sorry – but congratulations again! The Crystal Maze LIVE Experience London is for Players 18+ if we think you look under 18 we’ll be jealous – and will definitely ask for some ID. You absolutely, positively, definitely MUST arrive at least 15 minutes before your show time. Latecomers will not be admitted. Where is The Crystal Maze - LDN?